Tulipa orphanidea shows high morphologic diversity throughout Eastern Mediterranean. The populations of Tulipa orphanidea L. in Manisa province, are observed in terms of genetic diversity. For this purpose, leaf samples were taken from individuals in different populations and AFLP analyses were carried out by taking the related protocols into consideration. It is concluded that the Bardakçı and Spil populations are genetically distant from other populations and that the individuals in these populations are in speciation process. Eker, I.; Babac, MT; Koyuncu, M. Revision of the genus Tulipa L.(Liliaceae) in Turkey. Phytotaxa 2014; 157(1), 001-112. Marais, W; Tulipa L. in Davis, PH (ed.) Flora of Turkey and the East Aegean Islands. 1984; 8 Edinburgh. Güner, A.; Özhatay, N.; Ekim, T.; Başer, KHC. ; Flora of Turkey and the East Aegean Islands. 2000; 11 (supp.2) Edinburgh. Şık, L.; Erol, O.; Aktaş, K. Manisa Lalesi (Tulipa orphanidea L.) Tür Eylem Planı. 2015; Orman ve Su İşleri Bakanlığı, Doğa Koruma ve Milli Parklar Genel Müdürlüğü, Ankara. Pharmawati, M.; Yan, G.; Finnegan, PM. Molecular variation and fingerprinting of Leucadendron cultivars (Proteaceae) by ISSR markers. Annals of Botany 2005; 95(7), 1163-1170. ISNAD Morgil, Hande , Şık, Levent , Erol, Osman . "Genetic diversity by AFLP analysis within Tulipa orphanidea L. (Liliaceae) populations in Manisa". 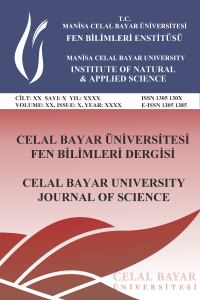 Celal Bayar University Journal of Science 13 / 4 (December 2017): 913-917.